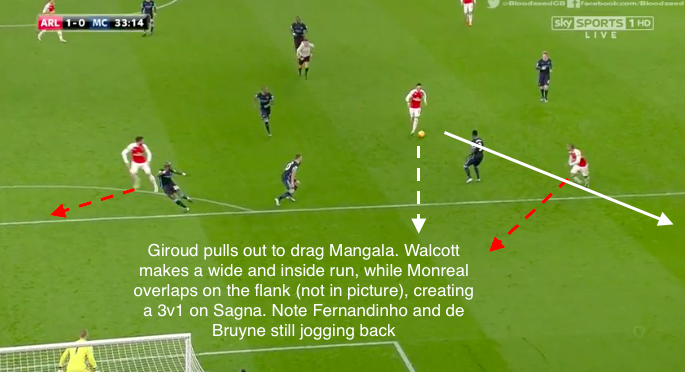 Daniel Wong writes a detailed a tactical analysis of the Premier League fixture that ended Arsenal 2-1 Manchester City. 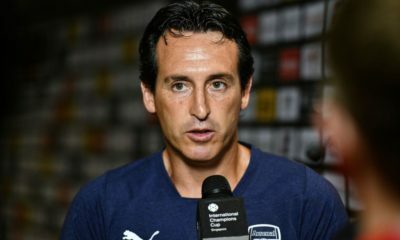 Arsenal have been regarded as title contenders all season, as demonstrated through their strong performance on Monday The Gunners were forced to dig deep at the end but got the result from another solid and disciplined team performance – the same of which cannot be said for the entire Manchester City side. Manuel Pellegrini’s side was the complete opposite of Arsenal’s: they were lazy, lacked teamwork, and appeared as if they ran out of ideas until the last 20 minutes of the match. Combined with mistakes and poor decision making (both from the players and the manager), it was yet another match against a top team where City could’ve lost by more than one goal. It is clear that City was missing Vincent Kompany, and the situation was further worsened by the fact that Aguero looked completely out of sorts. Arsenal’s victory leaves City six points off the top, and if City’s poor performances against top sides continue, their title hopes will be over. 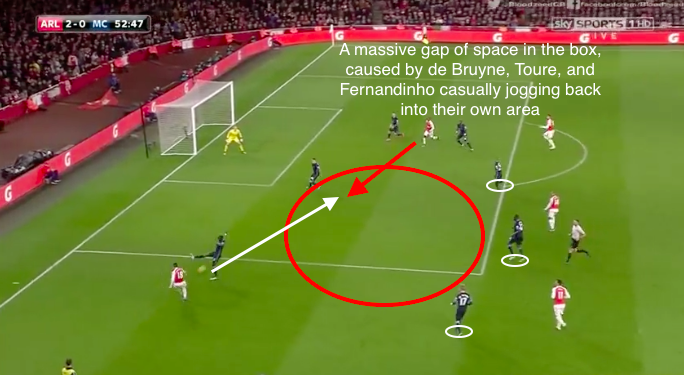 To understand why this happened, Arsenal’s game plan will be analyzed, in addition to a brief editorial on City’s shortcomings, shown by the analysis of the goals and goal-scoring opportunities. Arsenal’s game plan was consistent with what they have been doing all season against top sides. 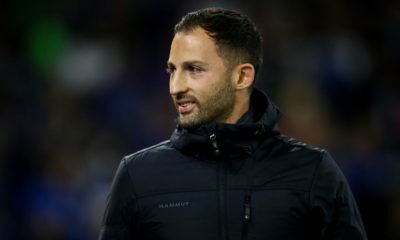 In possession, they showed their ability to build up patiently, passing short or direct, while also using quick counter attacks, and overlapping attacking full backs to punish the indisciplined City defence. 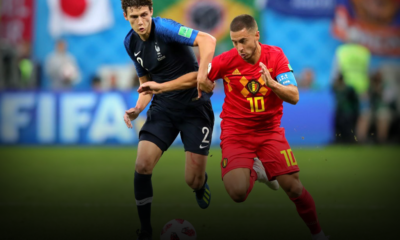 In defence, they constantly threw players behind the ball and at their best, would create compact blocks that restricted space for the creative players – in this case, Silva, and de Bruyne. 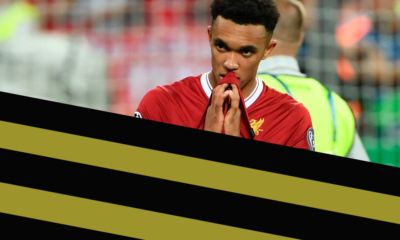 By consistently shutting down the most creative players on opposing sides, and being able to sit deep and counter or patiently build up in a mixture of short and direct passes, Arsenal have been able to carve out results against the top English teams. 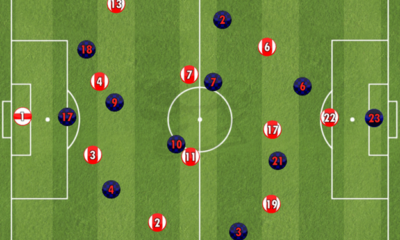 When in possession, Arsenal looked to patiently build the play up from the back. This was achieved through simple passes to each other, helped by the width created from the movement of the players. 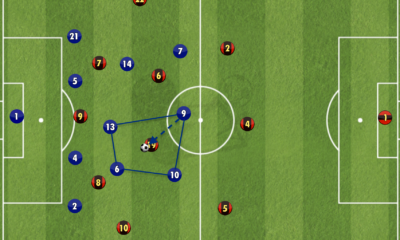 There were two ways the Gunners would move the ball into the final third. The first method was attacking on the wings. Arsenal would build out from the back using simple passes to easy options, starting with the centre backs going deep to receive the ball. Mertesacker and Koscielny drop deep into their own half and stay wide apart from each other, while Monreal and Bellerin would push out wide and almost to the halfway line. 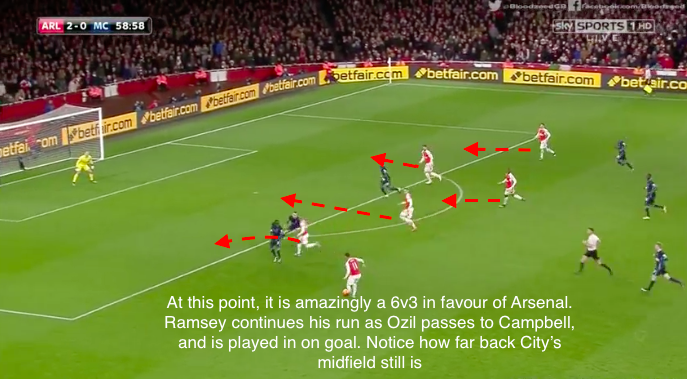 As they did this, Ramsey, Flamini, and occasionally Ozil would drop deep to recycle possession, Walcott and Campbell would tuck closer into the centre, and Giroud would push the City defence further back. 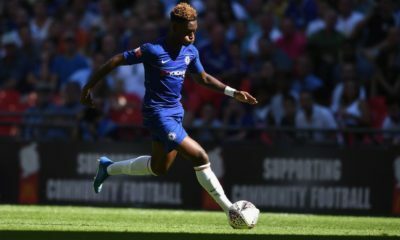 By tucking closer into the centre, and making short feinting runs to draw the attention of the wing backs, the wingers allowed the wingbacks to sneak further and further up the pitch when the ball was finally played to them. The second method was going direct, through the central areas. If Arsenal was under pressure, they had the option of going long, with Ozil and Giroud able to knock balls down and flick them on to teammates. In the build-up however, if they chose to go direct, they would aim to fizz passes into Ozil inside pockets of space. 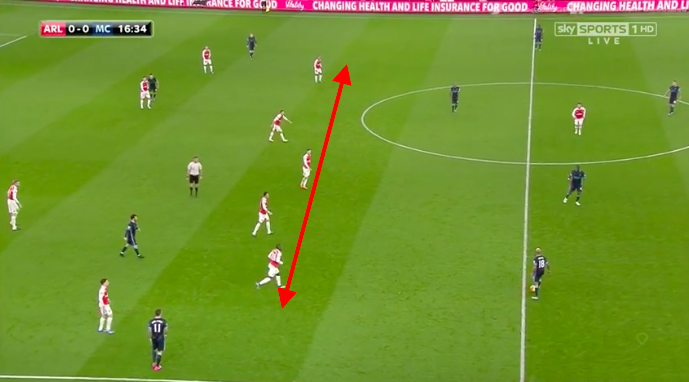 Koscielny and Ramsey would take turns doing this in the first half, and as City (and opponents throughout the year) left their shape to press the ball or were drawn wide or narrow by Arsenal’s wingers, pockets of space would be vacated for Ozil. In City’s case (which will be explored later), this happened far too often, and they were punished by the Arsenal playmaker, who finds himself on 15 assists and looking set to break the Premier League record. 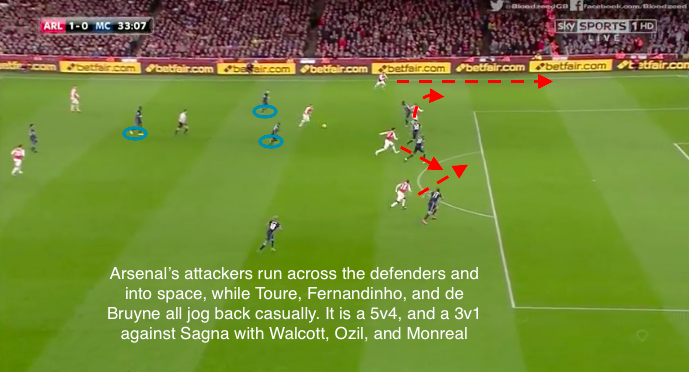 Ozil’s job was also made exponentially easier by the movement from his teammates off the ball, once Arsenal got into the final third. Monreal and (especially) Bellerin were often seen charging forward to join attacks, looking to provide overlaps and overloads on the flanks. Meanwhile, Giroud and the wingers would make runs across the City back four to drag defenders and create space. Campbell and Walcott would make their runs across the City back four, to the outside, and back to the inside. Their pace, especially Walcott’s, caused City huge problems with marking them, and resulted in Sagna staying very tight to Walcott. 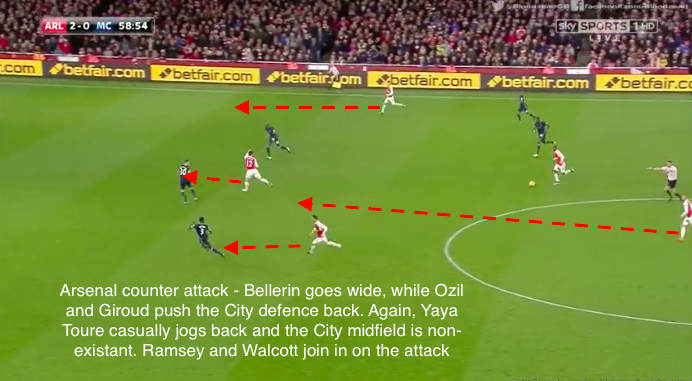 With Arsenal’s full-backs overlapping, it often resulted in 2v1’s against City, and in addition to the goals, the other goal-scoring opportunities Arsenal found which began on the wings showed how effective this was. 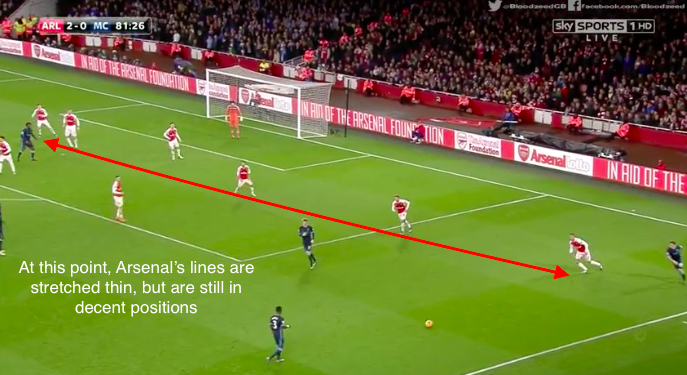 Looking at Arsenal’s defence, it appeared that Wenger placed a heavy importance on preventing City from playing passes between the midfield and defensive blocks. 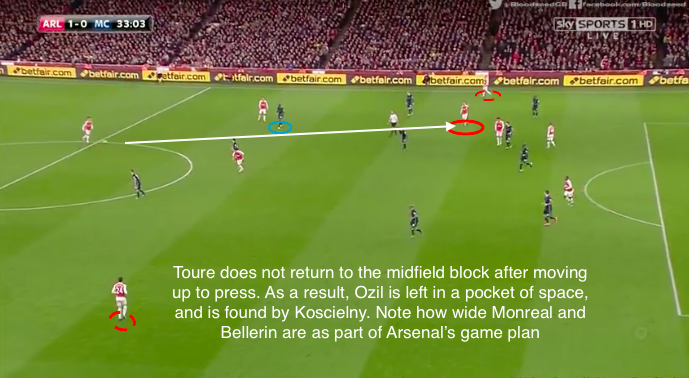 When sitting back and allowing City to build up from the back, Arsenal went to almost a 4-5-1, with Ozil dropping deep and filling up gaps in the midfield, which severely prevented City from getting the ball into the spaces between the lines. It appeared that Ramsey was given a relatively free role, which saw him often rotate with Flamini on the left and right sides of the central midfield, or to mark Toure. The one constant though was that time and time again, Arsenal would set up these blocks, and their willingness to shore up any gaps (until they inevitably tired) was evident. Ozil and Giroud worked hard to cover and press throughout the match, and their organized defence frustrated Pellegrini’s side. 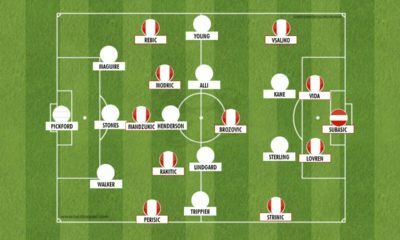 As City’s full-backs moved further up, Walcott and Campbell would track back to do their best to provide support for Bellerin and Monreal. Additionally, Flamini took upon the task of almost completely following Silva as City moved the ball closer to the midfield block, which limited his time on the ball. 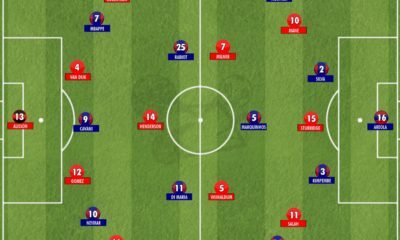 In an outstanding display of teamwork, the solidity of the Arsenal midfield block, and the narrow nature of the lines prevented City from moving the ball up through the centre of the pitch, which saw them play passes to their more creative players around the flanks or pass to their full backs. This suited Arsenal, who have shown over this season that they are most willing to press when opponents have the ball on the wings. In the first half, this was executed extremely well. Capitalizing on Delph being played on the left wing, their midfielders clamping down on space and options as City moved the ball out wide, allowing them to win the ball back a host of times. Lastly, they were helped by City’s stubbornness in playing through the centre and attempting to play passes towards their key players, despite them being in no position to receive the ball. Throughout the match, their poor passing decisions saw Arsenal able to exploit the last part of their game plan: the counter attack. On the counter, it was quite simple for Arsenal. Arsenal took advantage of the pace they possessed out wide in the form of Walcott, Campbell, and Bellerin, as well as using Aaron Ramsey’s box-to-box abilities to great effect in their counter attacking. With City’s full backs pushing extremely high up to join their attacks in both halves, Arsenal was able to counter in a dangerous fashion throughout the match. Walcott and/or Campbell would run across defenders to create space for Giroud, Bellerin, and Ramsey to attack. Combined with the Manchester City midfield’s reluctance to track back, Arsenal was able to throw bodies into extremely dangerous positions, and had they been more clinical, the score line would have been greater. Manuel Pellegrini got his player choices and their positioning hopelessly wrong from the beginning. 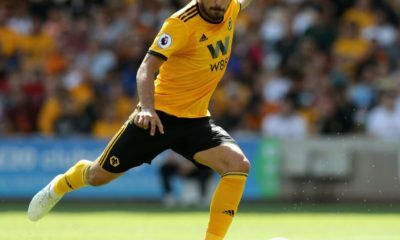 Aguero is the best striker in the Premier League when he is on his game, but to throw him into a game against a rival title contender after a three-week absence was asking too much. The Argentine was invisible and did not look alive the entire match, except for his sublime flick which played Kevin de Bruyne through. 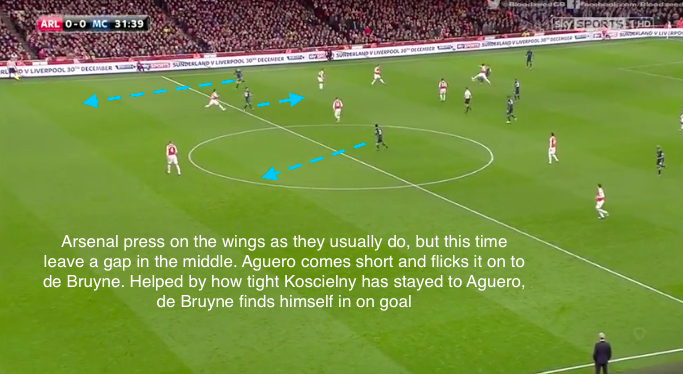 Aguero made virtually no diagonal runs across the Arsenal defence, and the lack of movement was frustrating to watch as a neutral. Delph’s selection was understandable, but where he was positioned was questionable. Jamie Carragher on Monday Night Football touched on how these high energy matches were perfect for someone like Fabian Delph, and it is a wonder why he was thrown on the wing instead of in the centre, knowing Yaya Toure’s laziness in tracking back. Lastly, playing Yaya Toure in the centre of the pitch, as it is common knowledge that the Ivorian does not show any willingness to track back. Carragher referred to Toure as “selfish”, and rightly so – as will be explored, Toure was nowhere near the action for each of Arsenal’s goals (and a host of chances), lazily walking back as Arsenal’s midfield ran past him. The difference between Arsenal and Manchester City’s defences was their work-rate. Defending requires a team effort, as Arsenal showed Manchester City and their other rivals this season. Manchester City have lacked this ethic, and they were found out on Monday. 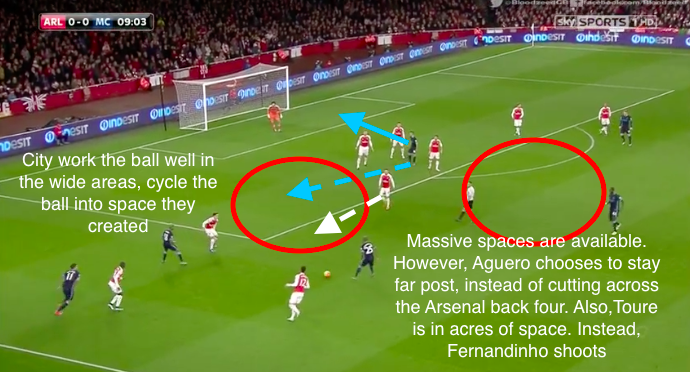 For each of Arsenal’s goals and goal-scoring opportunities, Manchester City’s midfield could be criticized for their casual approach to defending. It was obvious that Pellegrini wanted to set up midfield banks in a 4-4-2 shape, restricting passes into Ozil and Giroud in space. 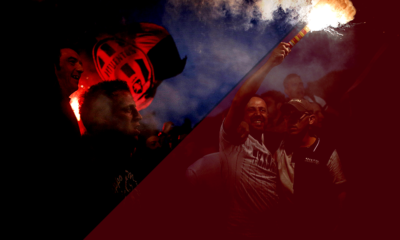 However, the criticism does not come from the shape, but rather the players in the shape. Discipline and work rate are not words commonly used to describe Toure, Silva, de Bruyne, and Aguero. They are fantastic attacking players, but defensively, they were hopeless. While City aimed to close out space centrally to force play wide, they failed to achieve that. 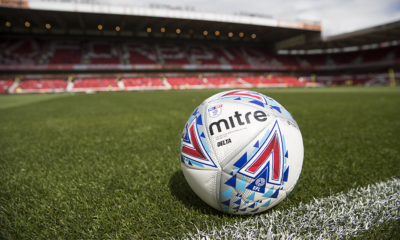 In addition, if the ball did get played out to the wings, their full-backs and centre-backs often found themselves in 1v2 or worse situations, and were punished for it. More often than not, the midfield block of four was missing, which resulted in endless pockets of space for Ozil. 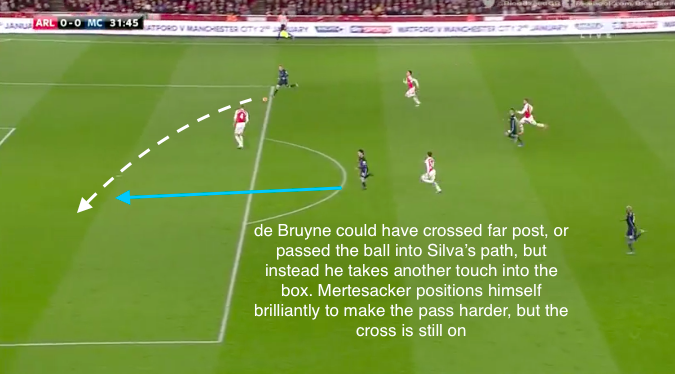 What was worse, was when they did isolate Ozil and force passes wide, Arsenal was still able to hurt City by overloading the flanks due to de Bruyne’s (and later Sterling) unwillingness to track back and help out Sagna. City’s futile defensive attempts are summarized by the amount of times Arsenal had as many, if not more bodies in City’s last third, than City themselves. 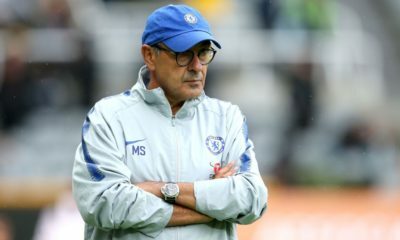 The defensive issues were exacerbated when combined with the poor team selection and positioning, such as Fabian Delph out wide and creative players like Yaya Toure and Kevin de Bruyne being assigned defensive responsibilities that they would never carry out. The last criticism is on the individual decision making from the City players. 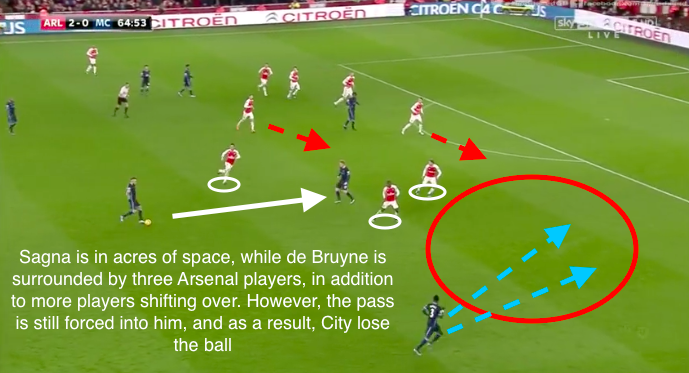 On Monday, City looked completely lost for over an hour due to their unwillingness to play simple passes, and the lack of movement from Delph and de Bruyne (though the latter improved on this in the final twenty minutes). Arsenal had congested the central area of the pitch, which meant that City would have to play through the wings in the first place. As a result, de Bruyne was forced to stay wide, occasionally dropping a little into the centre so that Sagna could receive the ball. Delph was devoid of ideas and found himself drifting closer into the centre, as his inability to create became exposed by Arsenal’s constant pressing once he received the ball. This still was not as big of an issue, as City’s most dangerous and effective zones were along the flanks and side of the penalty box. 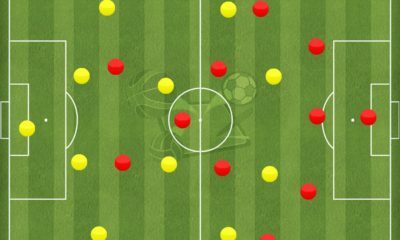 Once Sagna and Kolarov received the ball in the wide positions, there shouldn’t have been an issue – City have shown over the past few years that they are capable of breaking down organized sides using intricate passing in the wide areas and into the opponent’s box. 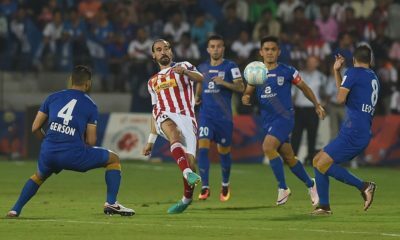 There were often players in great positions, which was highlighted in the first and last 15 minutes of the match. 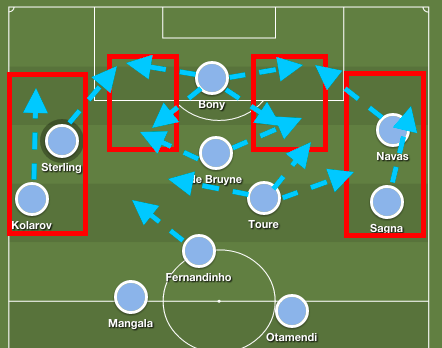 However, for whatever reason, on Monday Manchester City chose not to play the right passes. 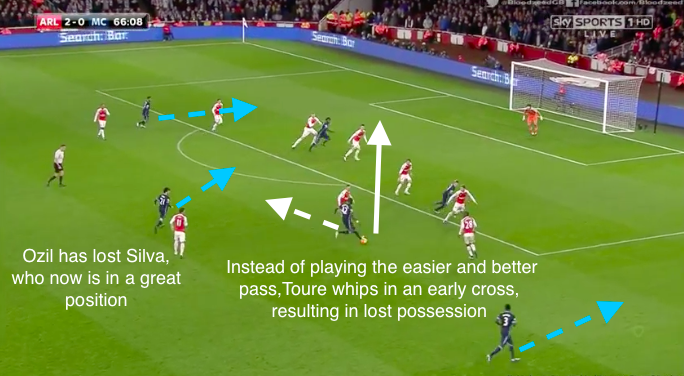 Instead of playing easy passes and recycling possession, they chose to force passes into the middle of the pitch into their more creative players, even though there were Arsenal players filling the space up, and time after time Arsenal won the ball and tried to counter. 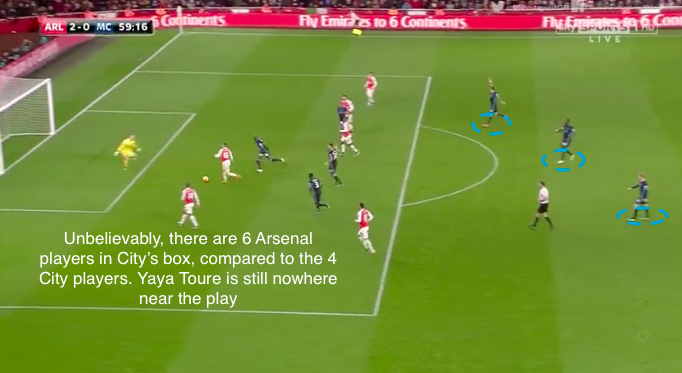 What was worse, was Sagna and Kolarov were in great positions throughout the entire match, but were neglected, or received the pass too late to do anything with the ball. City only looked at their best when they were in the wide areas, and when Sagna and Kolarov were involved in the attack. Sterling and Jesus Navas’ late introductions helped City move the ball into the final third and helped stretch out the Arsenal defence. De Bruyne was much more effective when he was given the free roaming role that Silva had occupied, and as a result of these changes City was able to put in a better display in the latter stages of the match. Furthermore, for all of Arsenal’s hard work and organization, they did inevitably switch off as the match dragged on and they dropped deeper, resulting in holes appearing in their defence. 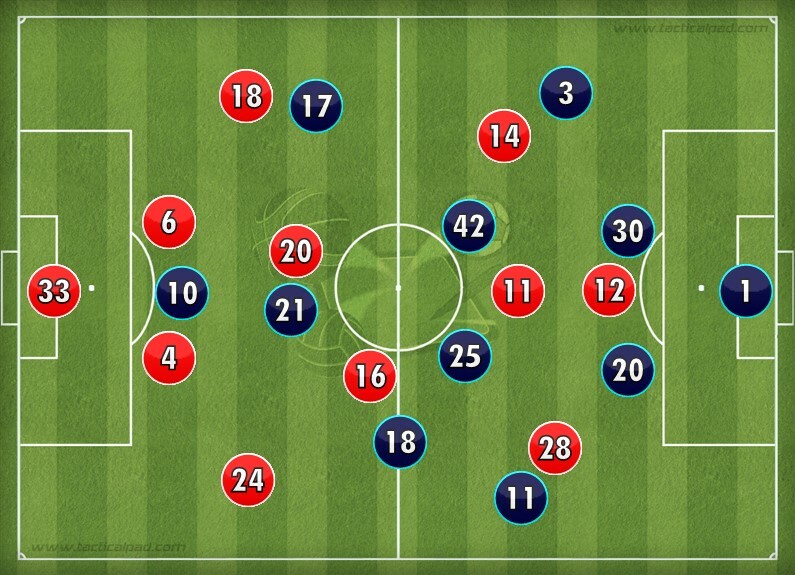 Additionally, City were able to create loads of space once they worked the ball out wide throughout the entire match. 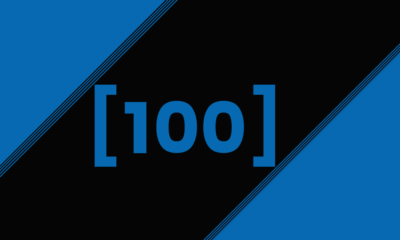 However, because City chose to force passes and whip crosses into the box once Bony came on, they were unable to exploit these mistakes until the last 10-15 minutes of the match. 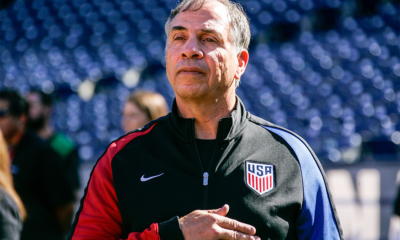 Though their late efforts were rewarded with a goal, it was too little too late. In the 31st minute, the first real opportunity of the match came for Kevin de Bruyne, who had been played in brilliantly by Sergio Aguero. Considering the form de Bruyne has been in all season, one might forgive him for shooting. 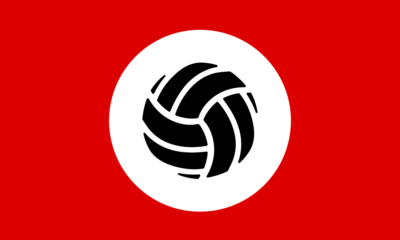 However, also considering his position, and the positions of his teammates, his decision to shoot was a poor one. It was always going to be difficult to beat a goalkeeper like Cech from the angle he was in. He twice had the opportunity to play in David Silva, and when he finally did shoot, Aguero was in a fantastic position to score as well. Understandably, Silva and Aguero were not pleased. In the 33rd minute, Arsenal scored their first of the match, with Ozil picking the ball up in a pocket of space after a good pass from Koscielny. 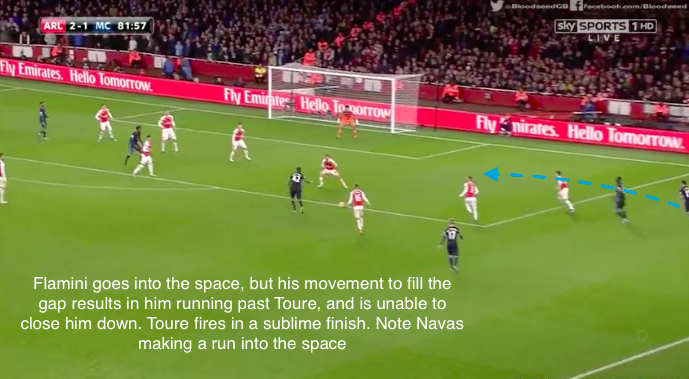 This came from Toure’s laziness in returning to the midfield block, and his absence vacated a pocket of space for the Premier League’s leading assister. While it appeared as if Ozil’s pass was meant for the overlapping Monreal, it didn’t matter as Walcott smashed home Arsenal’s first. 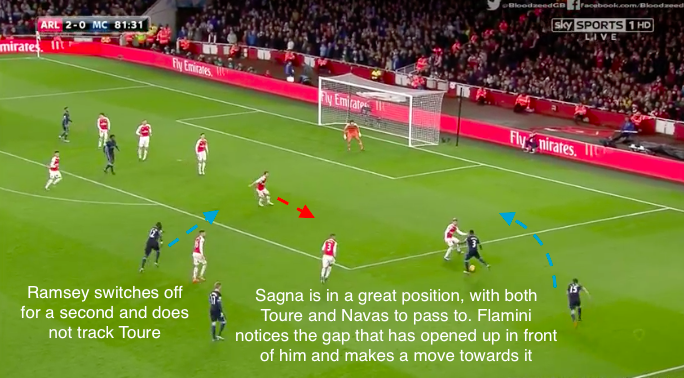 Again, Manchester City’s midfield efforts in returning to help their defence were criminal, and left Sagna in a 1v3 situation due to Arsenal’s movement. During the first half stoppage time, Arsenal scored their second of the match, courtesy of their high-flying Frenchman, Olivier Giroud. It all started from Mangala’s appalling pass, and his poor performances constantly put into question his £31 million transfer fee. Walcott picked up the Frenchman’s poor pass and immediately, Arsenal’s attackers came alive. 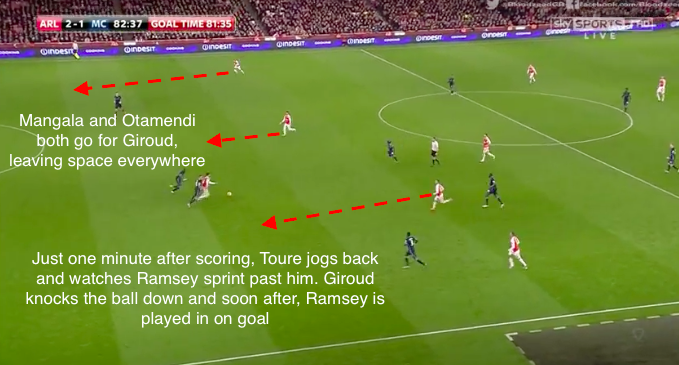 With Giroud running across Otamendi, Arsenal found themselves in yet another 2v1 situation, and the defender found himself unsure of whether to challenge Ozil, or follow Giroud. 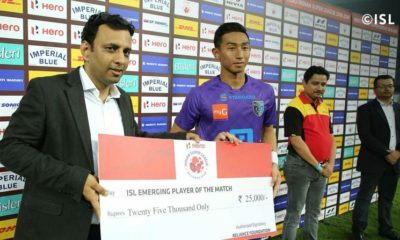 Furthermore, the issue was exacerbated by the lack of cover that the midfield provided the City defenders. 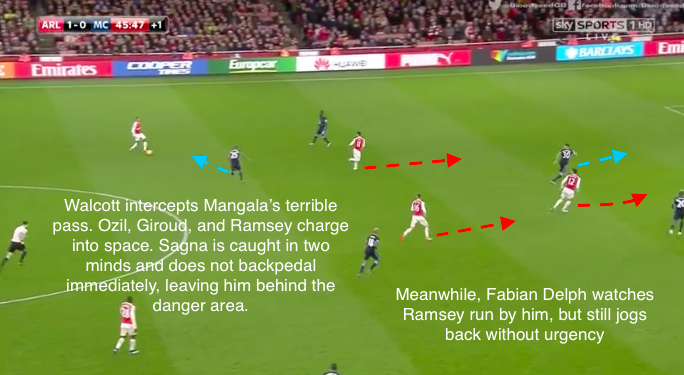 In stark contrast to Ramsey’s attacking run, Delph walked as Ramsey ran right past him, and jogged back until he wasn’t even on the same shade of pitch as he was. It was a shocking lack of commitment, and they were rightfully punished. In the second half, Sterling came on and City looked much more alive. However, their attacking endeavours left them open to the counter. In the 53rd minute, Joel Campbell got the first of his two opportunities. His second chance in the 55th minute was caused simply by a good long pass into space vacated by Kolarov’s attacking movements. 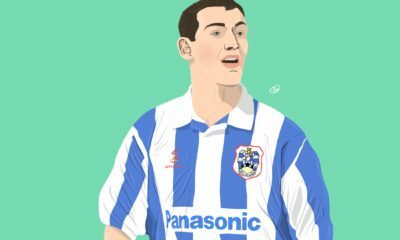 However, his first chance came from City playing too narrow, City’s central midfielders nonchalantly jogging back, and an overload of City’s right side. 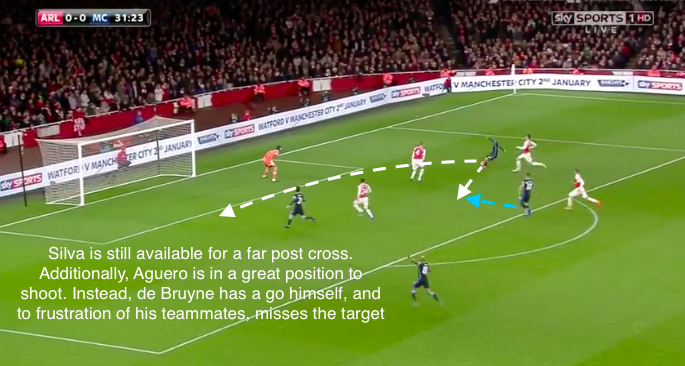 Again, Arsenal’s success was caused by an overload on a flank, with Sagna and de Bruyne facing a 3v2. The amount of space left in the box was criminal, and City was almost punished by the Costa Rican, who should have scored. Just three minutes later, in the 59th minute, Ramsey had a wonderful chance that truly summed up City’s lack of commitment. Bellerin managed to win the ball and get it to Joel Campbell, as Arsenal countered with intent. Ramsey and Walcott soon joined in on the counter attack, and yet again City’s midfield refused to show the same kind of intent to protect their defence. 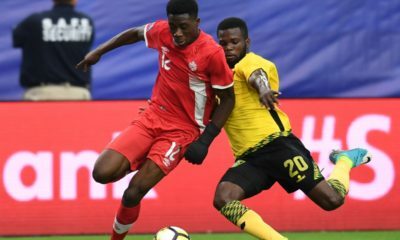 Yaya Toure simply jogged back towards his goal, and his sprinting just minutes later showed that his relinquishing of defensive duties was not due to fatigue. Instead, viewers were treated to an unbelievable image: six Arsenal players were in City’s box, against their four players. To compound this, the gap between the City midfielders and their penalty box was sizeable, and the Blues were only bailed out by a fantastic stop from Joe Hart. 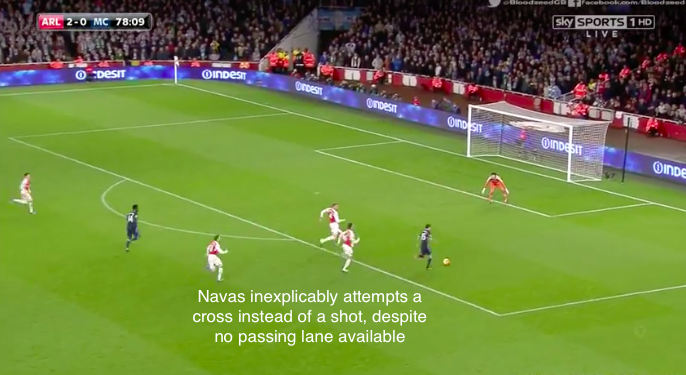 City looked extremely bright once Navas came on and provided great width for City, but his spurned opportunity capped off a match full of poor decision making. After being played in (albeit offside), he inexplicably decided to square the ball back to Bony, despite the Ivorian being in a terrible position, and Mertesacker having closed off the passing lane. It was yet another scoring opportunity spurned by City. As Arsenal tired, City was able to move the ball more dangerously, and they grabbed a consolation goal out of nowhere, courtesy of Yaya Toure. There is no questioning that Toure is a sublime attacking player, and in addition to his wonderful finish, the Ivorian bossed the next attacking moves that City was able to muster. 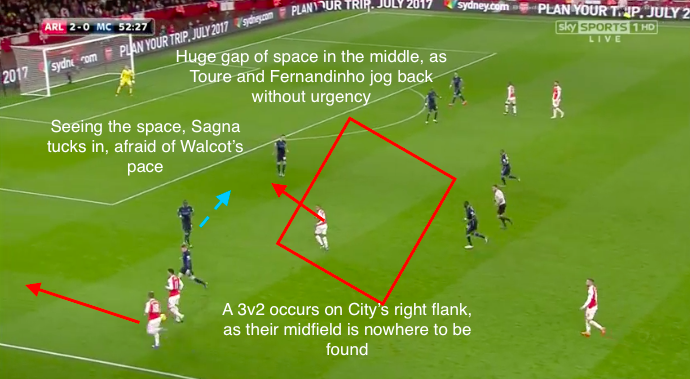 City had worked the ball into their most effective zones – out wide, which was possible due to Navas and Sagna staying extremely wide, and how deep Arsenal dropped. 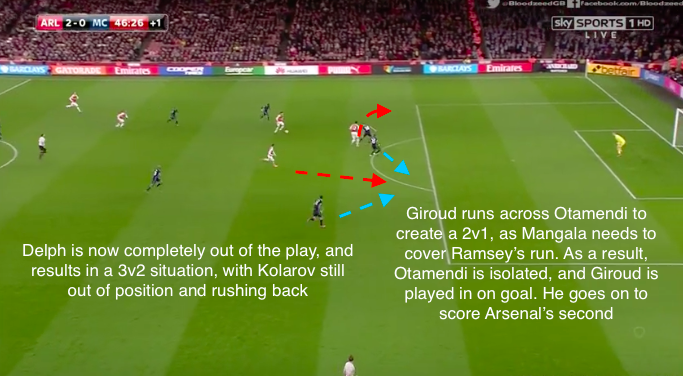 As Arsenal tired, space inevitably opened up, and Ramsey elected not to follow Yaya Toure, who ghosted into a great position at the top of the box. The finish put City within a shout, but unfortunately for them, it was too late. Amazingly, even the goal and a shot at drawing level with Arsenal did not give City the willingness to track back, as just one minute later in the 82nd minute, Arsenal had yet another a wonderful opportunity to put the game to bed. Giroud knocked down a long ball straight from the kickoff, as Ramsey began his run into space. Yaya Toure, after just scoring a goal, watched on as huge gaps opened again, and the Welshman was played clean through on goal. However, it was another unpunished error, and as a result, the match ended 2-1 for Arsenal. Had the Gunners been more clinical, the match could have easily ended in a three or four goal difference, but they took the win and consolidated their position in second place going into Boxing Day.